Theresa May today warns her warring party that if they vote down her Brexit deal they risk handing the country to Jeremy Corbyn – and being stuck permanently in the EU. The Prime Minister uses a powerful interview in today’s Mail on Sunday to plead directly with the dozens of Tory MPs who have threatened to rebel in Tuesday’s historic Commons vote on her Brexit deal. Mrs May, who says she has received thousands of messages of personal support from voters, tries to avert the rebellion by ‘weaponising’ the prospect of Mr Corbyn becoming Prime Minister. Such is the scale of the expected revolt – more than 100 Tories, by some estimates – that a growing number of senior Government figures are urging Mrs May to delay the vote and embark on a final bid to secure last-ditch concessions from Brussels this week. A defeat of that magnitude would leave her facing a putsch by either a Commons vote of no confidence or from within her own party if she did not resign. Mrs May tells this newspaper that Britain ‘would truly be in uncharted waters’ if the deal is voted down. But last night Mrs May suffered a blow when an aide to Defence Secretary Gavin Williamson resigned. Parliamentary Private Secretary Will Quince, a Brexiteer, handed in his notice saying that he was unable to vote for Mrs May’s deal. Nigel Farage is poised to launch a new Leave party to exploit Conservative divisions and push for a harder Brexit. Although there is a growing belief in Westminster that Mrs May could be forced to delay the vote, she last night insisted her Cabinet was united behind her. ‘I think we all recognise that this is a good deal,’ she said. Tory MPs have been in open revolt over the fact that the deal risks keeping Britain locked into EU rules indefinitely due to the ‘backstop’ designed to avoid a hard border in Ireland. But internal polling from Tory HQ obtained by this newspaper found that Conservative voters in Tory-held seats want their MPs to vote for the deal by a majority of more than two to one – suggesting that MPs who voted against the deal could be punished at the ballot box at the next Election. If Mrs May loses an immediate no-confidence vote on Tuesday, Parliament could have to sit on Christmas Day because the Fixed Term Parliament Act sets a deadline of 14 calendar days for a new Government to be formed, meaning December 25 would be the last chance for any coalition to try to win a Commons majority. It’s believed that the last time the Commons sat on Christmas Day was in 1656. 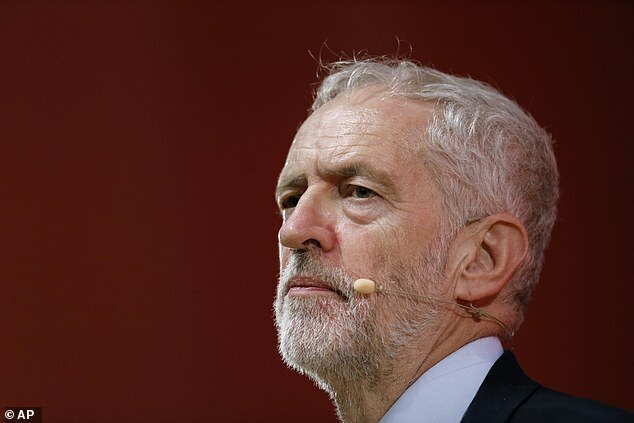 Labour MPs are privately urging Jeremy Corbyn to table a no-confidence motion against Mrs May if she loses the vote on her deal in the hope that it leads to a second referendum. Mrs May’s allies argue that, if the deal crashes, it will not only lead to the end of her leadership but the suspension of Article 50, the triggering of an Election likely to lead to a Labour-SNP coalition Government, then a second referendum to try to reverse Brexit. If these are Theresa May’s final days in Downing Street, she seems remarkably sanguine about it. 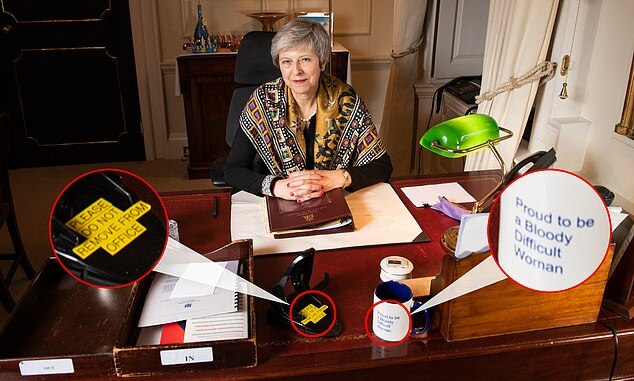 Despite intense pressure from all sections of her party to cancel Tuesday’s momentous Commons vote – or risk a humiliating defeat which could sink her political career – the Prime Minister exudes a calm humour as she talks in her No 10 study. Her allies say this is testament to her steely temperament and patriotic sense of duty; her detractors describe it as a stubborn refusal to change her mind in the face of overwhelming opposition. As carol singers strike up in the street outside, Mrs May expresses the forlorn-sounding hope that she can bring the war with her party to a close in time to enjoy her traditional roast goose for Christmas. Says her proudest achievement over her political career is the work she did on modern slavery. With the number of Tory MPs opposed to Mrs May’s Brexit deal now estimated to have reached triple figures, the Prime Minister tries to quell the rebellion by weaponising the threat of Mr Corbyn and his predominantly pro-EU party. ‘I’m not somebody who is normally a doom- monger [but] I genuinely am concerned that we would see greater division and greater uncertainty,’ said Mrs May. ‘The Labour Party see this as a way of trying to engineer a General Election. They are not looking at the national interest. She tells her rebellious MPs: ‘If you want Brexit, make sure you get it, and that’s about this deal. ‘When I say if this deal does not pass we would truly be in uncharted waters, I hope people understand this is what I genuinely believe and fear could happen. It would mean grave uncertainty for the nation with a very real risk of no Brexit or leaving the European Union with no deal. ‘We have a leader of the Opposition who thinks of nothing but attempting to bring about a General Election, no matter what the cost to the country. As someone who cares passionately about my country and my party, I believe Jeremy Corbyn getting his hands on power is a risk we cannot afford to take’. Although multiple sources say that a growing number of senior Government figures were urging Mrs May to delay the Commons vote until after another attempt to extract further concessions from Brussels, the Prime Minister was maintaining the line that her Cabinet was united behind the idea of holding the vote this week. ‘I have obviously talked to my Cabinet colleagues as well as I talk to other colleagues. I think we all recognise that this is a good deal’, she insisted. Mrs May is privately furious that the Brexit ‘ultras’, including Jacob Ress-Mogg and Boris Johnson, are so determined to crash her deal that they will topple a line of dominos which could lead to a vote of no confidence, the end of Mrs May’s leadership, the suspension of Article 50, a General Election ushering in a Labour-SNP Government and a second referendum to attempt to reverse Brexit. As one ally says: ‘We would go to hell in a handcart’. But while large sections of her Parliamentary party remain unconvinced by her deal and her determination to put it to a vote, Mrs May says she has been cheered by more than 3,000 personal messages of support from ordinary voters. Mrs May – one of the most effective stonewallers in Westminster –deflects all questions about whether she will resign if she is defeated over the deal or go back to Brussels to demand more concessions. But she is openly dismissive about moves by a cross-party group of MPs, led by Tory MP Sarah Wollaston, to call a second referendum – and withering about her predecessor Tony Blair’s call for one. The prospect of another General Election, particularly after last year’s fiasco, chills many Tory MPs, who argue that the party machine is not ready to fight a successful campaign, and that Mrs May is the wrong person to lead them into one. She isn’t exactly enthused by the idea either: ‘There isn’t going to be a General Election. As far as I’m concerned, the next General Election is 2022. Jeremy Corbyn is trying to engineer an Election but the last thing this country needs is the instability and uncertainty that would produce’. 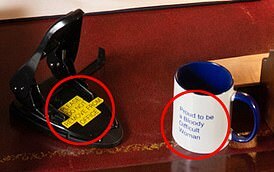 Mrs May was delighted when former Chancellor Kenneth Clarke called her a ‘bloody difficult woman’, and she celebrates the epithet on her mug. But will she last longer in her office than her hole punch? Valiantly, Mrs May said she hoped the deal could be voted through by Christmas so she can enjoy that goose and ‘a nice glass of red’ chosen by Philip. ‘I think most people want us to do this, to get it done and get it all wrapped up by Christmas and actually focus on the future,’ she said. The Mays will be sticking to their usual meal. ‘It’s always goose I’m afraid, yes. Most people always cook turkey, I always cook goose. With everything else that’s going on it’s tried and tested. I try to do a slightly different recipe every year. I saw one in a magazine the other day’. Her devotion to Philip, who she married 38 years ago after meeting at Oxford, is obvious. The tight bond between the pair was forged in extremis when her father, an Oxfordshire vicar, died in a car accident a year after the wedding. Her mother died the following year and she does not have any siblings. Mrs May praises Philip’s Christmas present choices, saying he is particularly ‘good at handbags; he does pick a good handbag’. 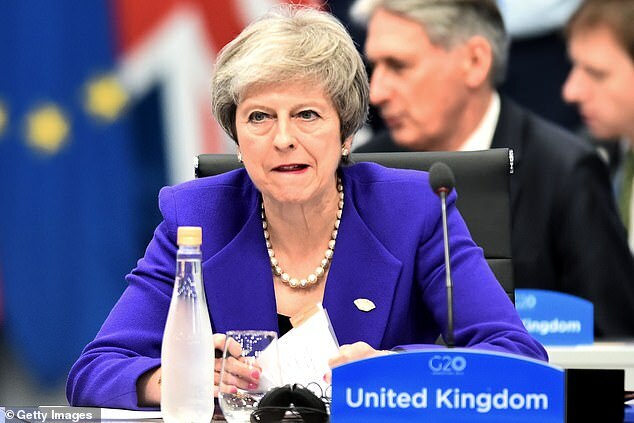 Even Mrs May’s fiercest critics admire her resilience in the face of what must be almost intolerable pressure, combined with official duties such as last weekend’s 14,000-mile round-trip to the G20 summit in Argentina. It was former Chancellor Kenneth Clarke who delighted Mrs May by describing her as ‘a bloody difficult woman’. She adds that she never takes out the strain on her staff. ‘I am not the sort of person who naturally loses their temper,’ she says, but confesses she does swear ‘sometimes’. Does she ever wake up with nightmares? ‘If I woke up and went “aaagh!” I’d probably have several armed police officers coming into the bedroom,’ she replies. Food has always been a passion for Mrs May: the woman who has more than 150 cookbooks says she is currently enjoying Ottolenghi Simple, by Yotam Ottolenghi, the Israeli-British chef. But she hasn’t been to the cinema since watching Skyfall six years ago. Mrs May’s vicarage upbringing was imbued with the sense of public duty exemplified by her father’s work in the parish. ‘What my upbringing taught me was whatever you’re doing, put your whole self into it and do your best. ‘I am genuinely trying to do my best for the country. I suppose it is a sense of public service’. Mrs May is keen not to strike a valedictory tone in the interview – but cites her work on modern slavery and establishing the National Crime Agency when Home Secretary as the greatest achievement of her political career. And she laments the fact that Europe has suffocated the domestic agenda, with passions such as boosting technical education and her industrial strategy drowned out by the noise of Brexit. But is she still the best person to lead the Conservative Party?